It’ll be nearly 365 days until Coachella season strikes again but that doesn’t mean we’re over our fave festival. It’ll be nearly 365 days until Coachella season strikes again but that doesn’t mean we’re over our fave festival. We’re still bookmarking hair inspo, summer style, and of course drooling over Rihanna’s crystal Gucci look. Riri wasn’t the only one slaying in Indio. 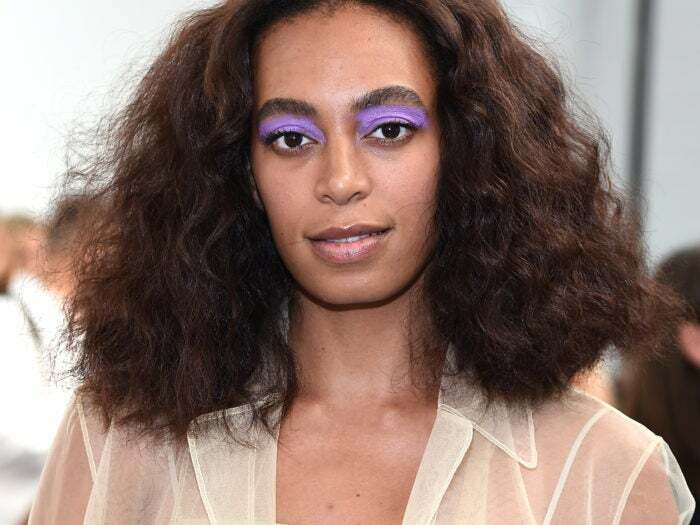 Our girl Solange and her newly auburn tresses owned Coachella with her signature cool-girl style and flawless makeup. Solange’s makeup artist broke down her 112 degree-proofmakeup to The Cut, and we’re taking notes. We had no idea this spray was such a powerhouse. According to Urban Decay’s site, the spray, “preps, primes, and balances the complexion while evening out skin tone, absorbing oil, and reducing shine.” Oh it gets better, Urban Decay B6 has the first stabilized form of B6, vitamin E, and willow bark to exfoliate. Fancyyy. A little Glossier Stretch Concealer ($18), NARS Smudge Proof Eyeshadow Base ($26), individual lashes, and By Terry’s Glow-Expert Duo Stick in Amber Light ($48) completed the look. We won’t be spending our summer worrying about a little sweat. We’d much rather be dancing in a canyon wearing only the finest gold fringe.